He's a celebrity because his dad pays for his tuition and doesn't bother to show up for class and hassle the professors. Perfect university situation. Hum, with a computer from Big Business, a cell phone from Big Business, using internet and cell towers that use Big Business. All funded by Big Banks and Wall Street. Dolt! We could scrap the Capitalist system we live under tomorrow and become a Communist state as was the old Soviet Union/Russia and this turd Henry WOULD STILL end up in a gulag. Even under Communism they had to work. 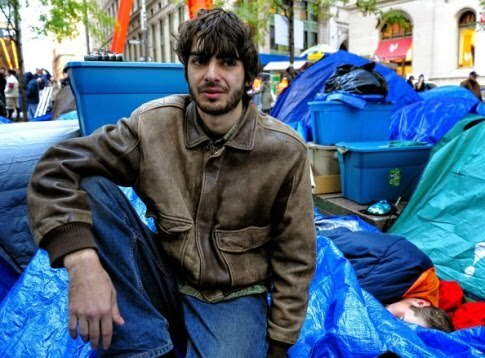 What is this useless POS planning on doing with his life after all the OWS is said and done and ancient history? I'll tell you - he doesn't have a clue. Enjoy your five minutes of fame douchebag. I have a feeling things are going to get tougher very soon for all you wankers and slackers. Well, Henry, you may be "like a celebrity" back home, but where you are, you are a pig. What a big huge mess you guys are making on someone else's property, and you are not paying the cost of your mess. You are just nasty and filthy. Somehow, I'm not surprised that this guy is from Univ. of Alabama. War. Damn. Eagle.